Although the title says Day 37, this post covers the last few days or so. I have spent many hours travelling along the spiral arm, and discovered to my delight, that a Nebula was getting reasonably close and well worth taking a look at, even though it meant my traversal with respect to distance from SOL wouldn't change much. Surveying 70 systems is quite time consuming, so this should give a good indication at hour many hours I have spent doing this! The only systems out here that had already been discovered were around the nebula; quite a small amount in reality, but certainly expected. In this particular session I traversed across 3 star fields and was quite nice to see different systems in my spreadsheet which I have to admit, was looking rather repetitive. Considering how far I have travelled so far, which is around 5000 Ly, it makes me wonder about the kind of players that will be embarking on the 2nd Annual Voyager Challenge, which is 60,000 Ly in 40 hours. I think these folks have to be exceptionally dedicated or bordering on the verge of madness! How often do you view the core? Does it change much in your travels? Well, as I was nearing the nebula, I noticed that the core was becoming clouded over quite significantly. This wasn't due to the nebula I was visiting, but most probably due to the density of Red Dwarf Stars in the line of sight. The image below demonstrates my reasoning. Of course I may be wrong, but seems to make sense to me. 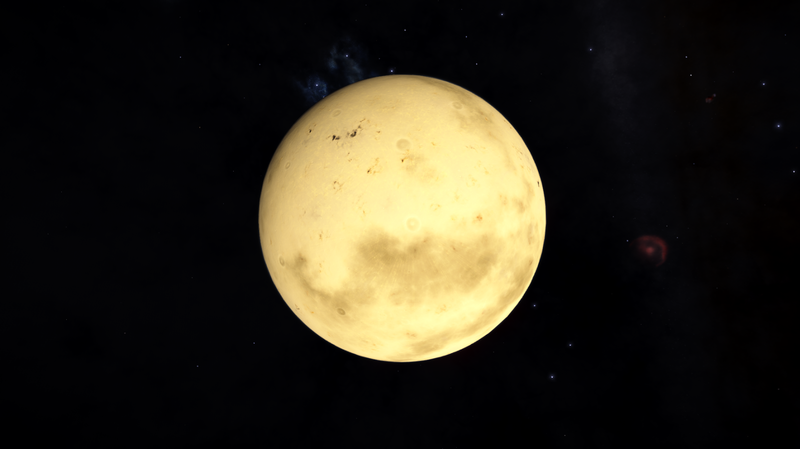 At a distance these darker stars would appear to be cloud like. Often, when exploring systems you come across 2 bodies which orbit each other. I have begun to start looking at them, not only because they can make some excellent screen shots, but also to see if whether the bodies are very similar or very different. As expected there are both. Sometimes they are in such a great position that the lighting is just perfect, but others the are in deep shadow and very difficult to get some decent pictures of them. 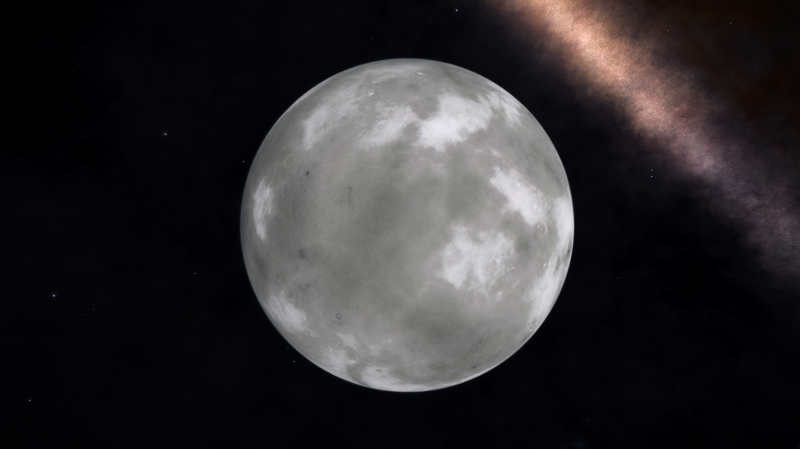 These next 2 images, sadly were not in the right orbit to take a single picture of them, but both of these were within a couple of Ls between each other, and were very similar. "Why have got so many pictures of twinned bodies?" I hear you ask... Well, these make great desktop images and my screen saver is set up to cycle between all of my favourites. I am slowly running out of drive space, so I need to start to be more picky... (or get another SSD drive!). 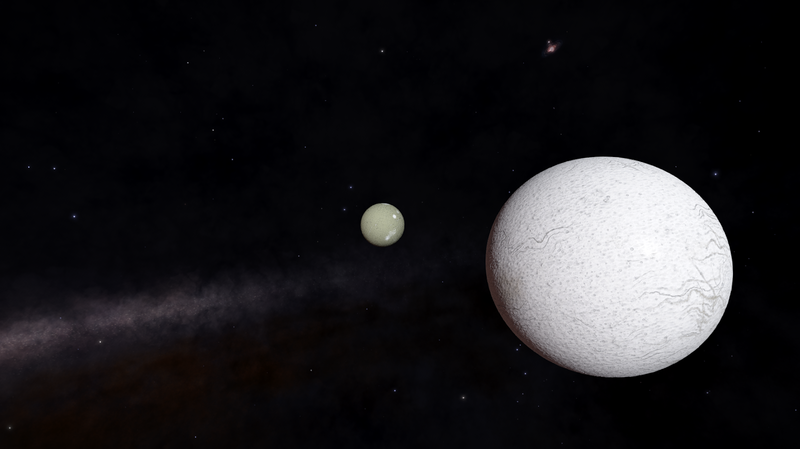 Often finding twinned bodies orbiting a Gas Giant. Then there are those that different. More diverse, but still twinned. Then there is the very diverse. 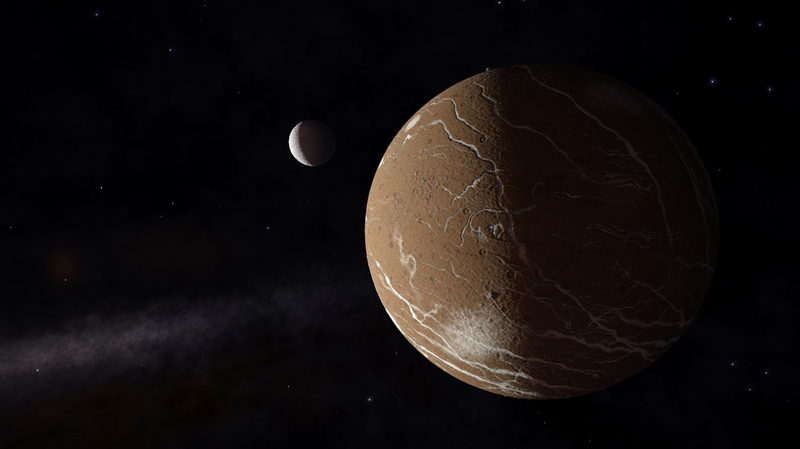 A water world twinned with a rocky body. 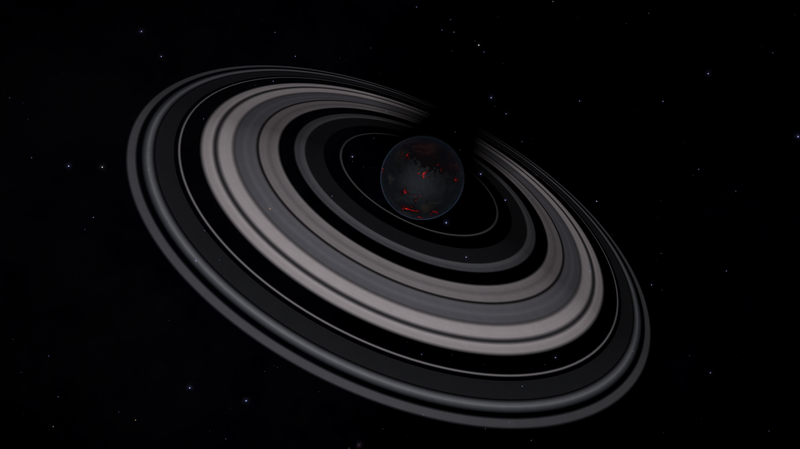 As I mentioned at the beginning of this post, I have made a detour to a nebula. 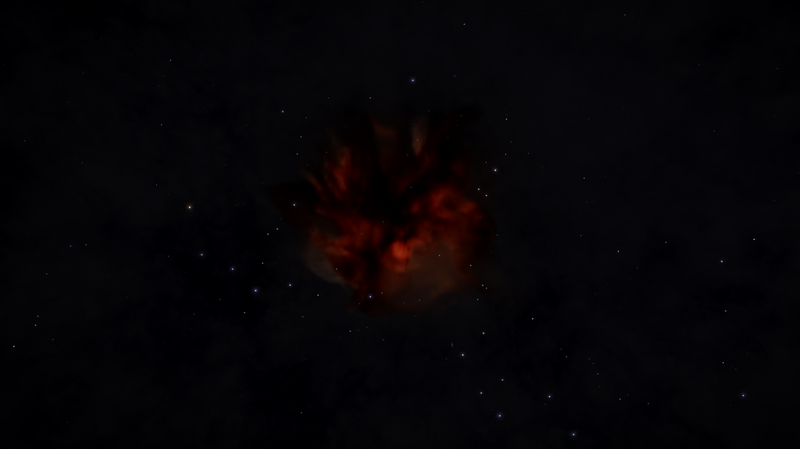 Now this is not the most exciting nebula in the galaxy, but having a peek at. This is the Crescent Nebula and you can locate it on the galaxy map by typing in Crescent. It was about 800 Ly from the way-point I had reached, so it was a good time to have a change in direction. The Crescent Nebula as from a few hundred Ly away. 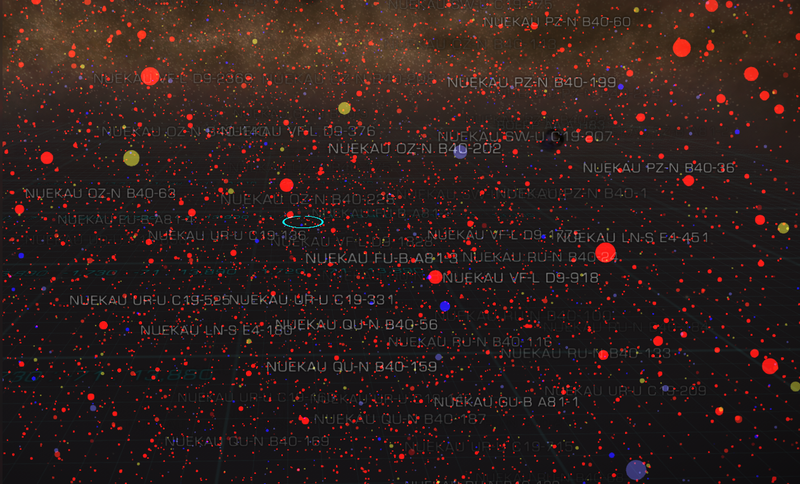 The nebula looks much better and defined when further away, so as you approach jump by jump, it seems to dissipate. 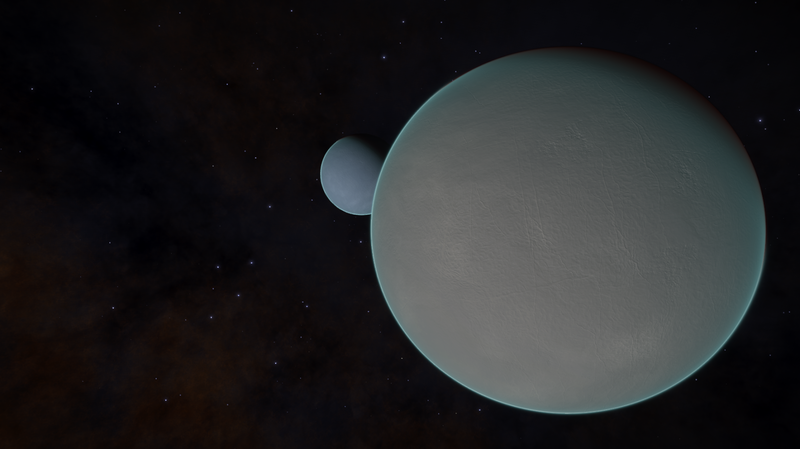 The central star, and one you can use as a way-point is CRESCENT SECTOR DL-Y E6, and this is the one with the neutron star. 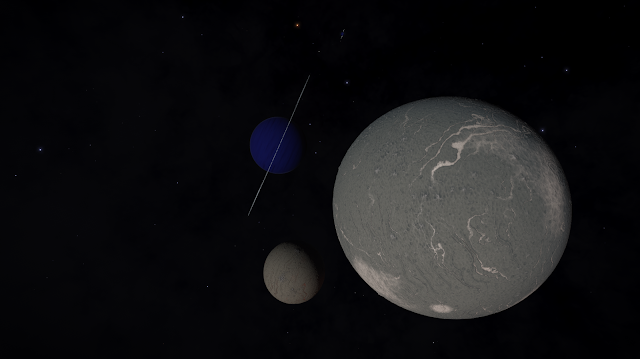 Be careful once you jump into the system as you will be very close to this body, so turn your ship around and get away from it. 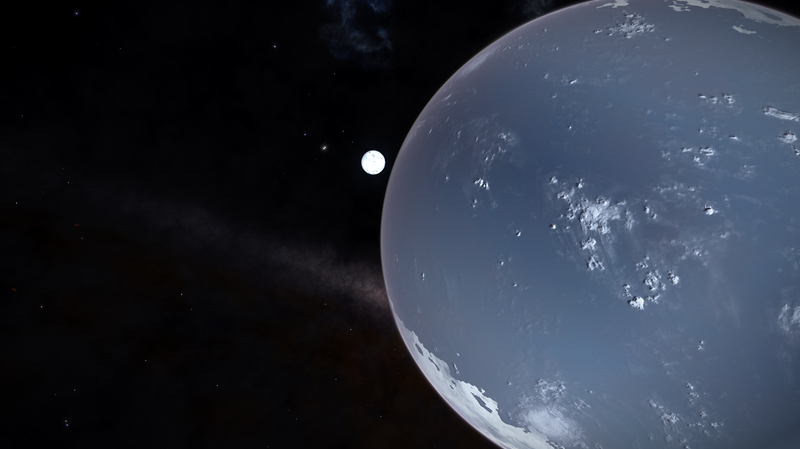 It is very surprising at how close you need to get to actually see this Neutron Star as something bigger than a dot. 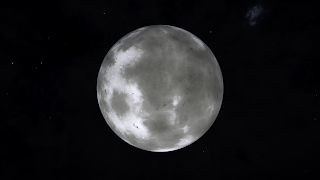 I had to admit, I didn't get too close I I had no wish to crash and loose all of my exploration data. 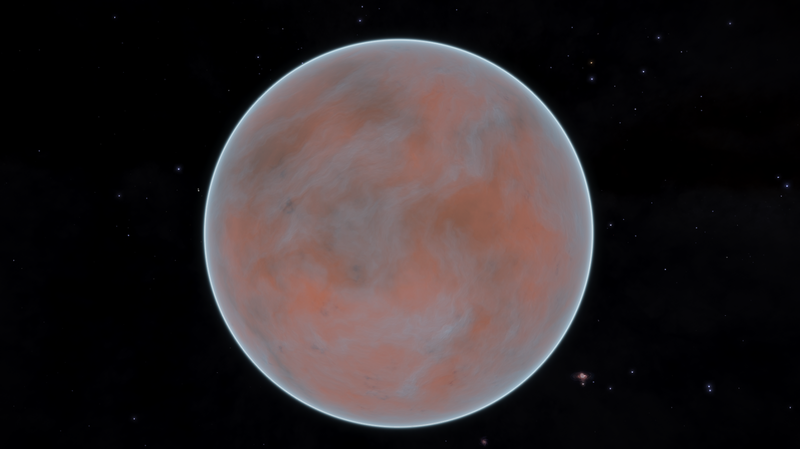 There is a great picture of it here using the Hubble palette, together with a brief informative description. The neutron star is the bottom left star of the triangle. Not much light in this nebula to show these dark bodies with a lot of detail. 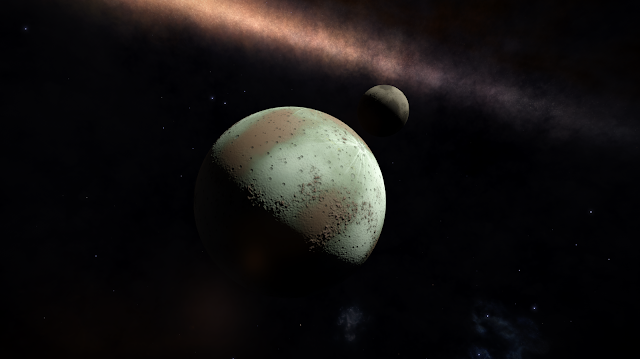 This central system to the Crescent Nebula was quite a dark and foreboding place. Needless to say it left me a little apprehensive about parking the for the night, so after taking a few pictures, I decided to retire in a nearby system where I felt safer. 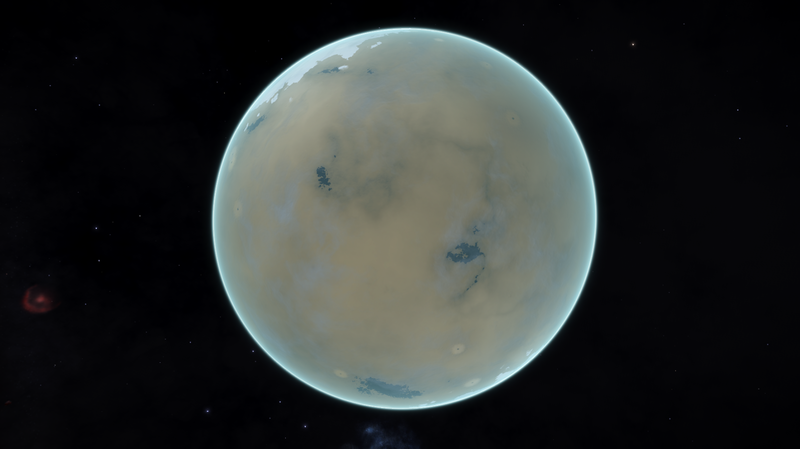 It seems strange, that a game can affect one so much; this is most definitely an atmospheric system, filled with darkness and radiation. 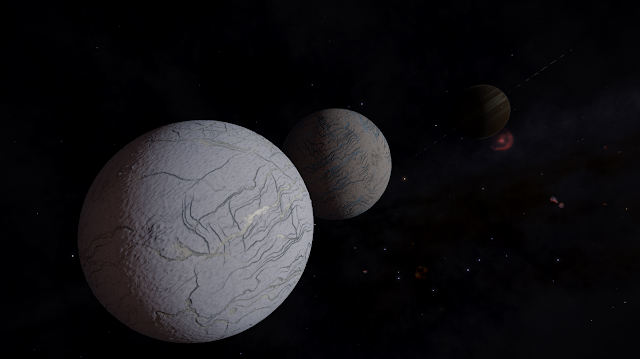 I have to admit I am glad to have seen such a system, but also glad to be off again into the wonders of the galaxy. 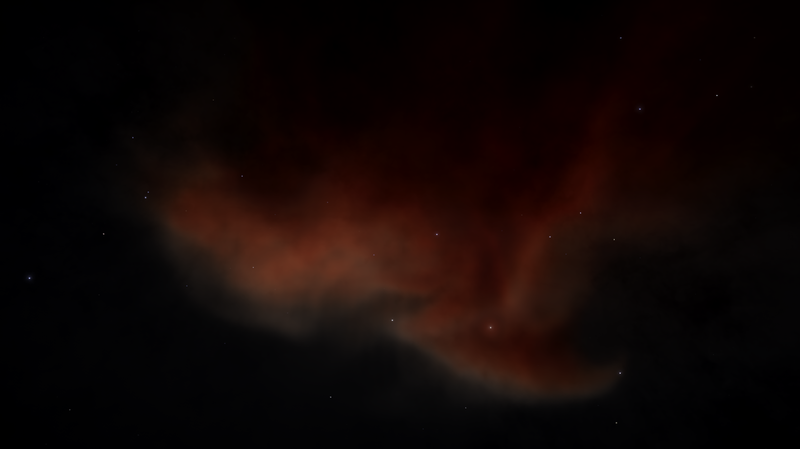 Would I recommend anyone to visit this nebula? I am not sure. 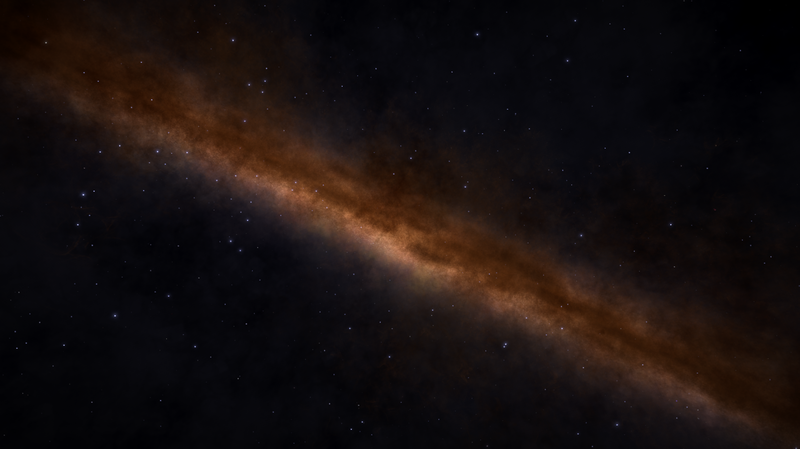 It is most certainly one of the smaller nebulae, and perhaps graphically, a little disappointing, but if you are within say 500 Ly of here, then yes, pay a visit and grab yourself an extra 43 - 46k credits.